Retail Stores are constantly struggling with keeping control over massive amounts of inventory each year. 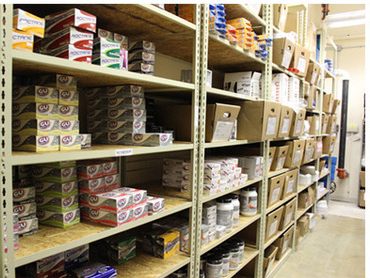 Most retailers either don't have efficient space or the right kind of storage shelving for their back stockrooms. With the most advanced technology, Burroughs provides "Rivet-Span" that has a large amount of configurations and sizes to store any type of retail inventory product that will make the best use of available space. This includes, but is not limited to: clothing, apparel, fabrics, shoes, sporting goods, paper, paint, hardware tools, appliances, electronics, food items, and other categories.